Today I cook a simple pasta dish from the vegetarian Belgian cookbook La cucina verde. Together with fresh vegetables, black pasta and salicornia, it forms a nice dinner with lots of color! 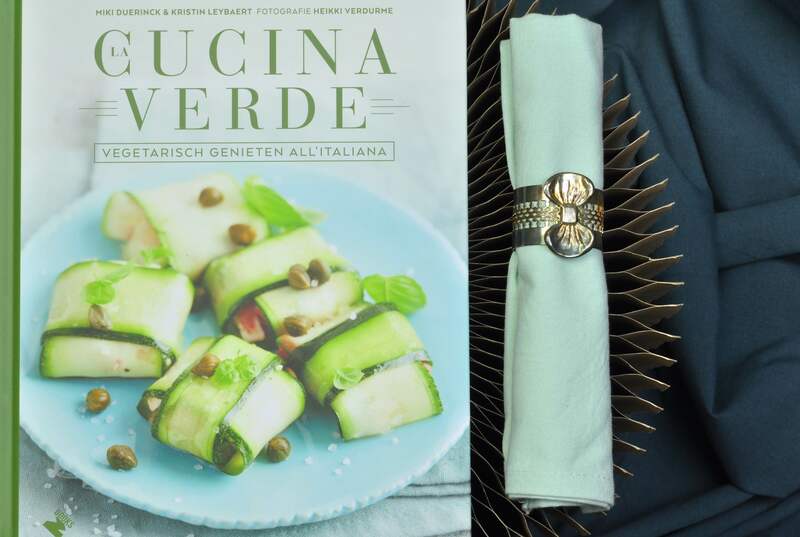 The book La cucina verde – vegetarisch genieten all’Italiana (freely translated Enjoy vegetarian food in an Italian way) written by Miki Duerinck and Kristin Leybaert. The authors have written several cookbooks together earlier, all with vegetarian food in focus. Together they run a cooking studio with perhaps the more unusual combination of Italian and vegetarian food. Of course recipes for pizza, pannacotta, lasagna and risotto are mentioned in the book together with all the other classics we recognize from the Italian cuisine. Still the same but yet slightly different. The traditional cuisine is blended with new influences and the dishes get a new interpretation. Italian food often includes a lot of different cheeses and cream. This book is no exception but most of these ingredients are replaced in many cases. The parmesan has been replaced with finely chopped cashew nuts and nutrient yeast mixed with pepper and salt. The mozzarella in the classic parmigiana has been replaced by silktofu and so on. Most recipes are simple and easy to use in a daily repertoire. No difficult ingredients or recipes needed. Some recipes are also really fun like the lemon mousse with parsnip and mezzaluna sheets made from tamari, ginger syrup and agar agar. They are definitely on the list of what still has to be tested in my own kitchen! From the book I have chosen to make a simple recipe with vegetables and the exciting salicornia. The recipe is a good introduction to the salty sea flavor in the salicornia. Fun to do, really fast to make, just like pasta should be. To get even more color on the dish, I decided to use pasta made of black rice instead of traditional but that is of course up to you. I just love colorful food! 1. Bring water to a boil in a larger pan. Cook the pasta as instructed on the package. 2. Bake the sliced ​​shallots in olive oil. Add garlic and chili peppers. Add the carrots and bake them half-way ready Add the red pepper and fry until soft. Add finally the sliced ​​courgette and fry them shortly with the other vegetables. 4. Add soy cream and dilute the liquid with some of the pasta water from the cooked pasta (se note above). Add the salicornia and flavor the sauce with lemon peel, tarragon, a tiny amount of salt and freshly ground pepper. 5. Add the vegetables and cream to the pasta just before serving. For extra cream add some extra soycream or past water. This book is available in Dutch. This book sounds wonderful – and unavailable to me…have you ever seen it in English?? Im so happy to hear you’re enthusiastic about the book! Unfortunately I don’t think the book is available in English (yet?). Maybe if you contact the publisher named in the post?